Anyone who has stepped outside in the past three days in southern Minnesota knows how intensely uncomfortable the heat indexes (heat + humidity, what it actually feels like to us) have been, although some might not realize that they are historically uncomfortable as well; yesterday, many of us in the southern half of the state saw dew points around 84 degrees Fahrenheit, which is a new record for Minnesota. The heat indexes, then, were topping out near 120 degrees, and thus any time spent outdoors was deemed dangerous with a probable chance of heat-related illnesses. Relief comes in the form of a possible thunderstorm tonight, thankfully, resulting in cooler highs in the 80’s for the rest of the foreseeable future. It’s tough on Mother Nature when it feels like the inside of an oven outside. Whereas us humans only need escape into an air-conditioned building (staying outdoors , wildlife must find other methods of staying cool. On Monday, three American Robins were happily bathing in the Johnson Waterfall Garden on the west side of the Interpretive Center; they were so intent on splashing themselves, in fact, that they really weren’t paying much attention to the group of fifteen or so people watching them from under the shelter not more than ten feet away! 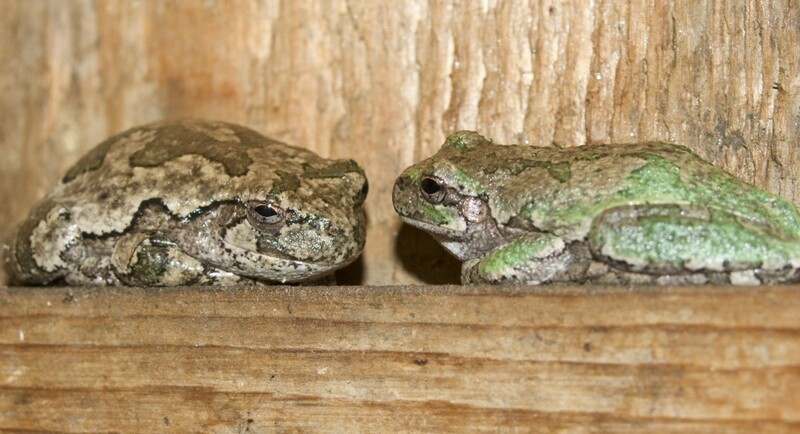 And there are now TWO gray treefrogs roosting right above the Interpretive Center’s front door; in addition to being comfortably in the shade here throughout the daylight hours, they are also in a prime position to catch any bugs attracted to the overhead door light once the sun goes down. Gray Treefrogs roosting above Interpretive Center's front door, 7/20/11.